Canadian winters can be long, dark, and dreary. For some, that can be a recipe for disaster. For Krista Dalby, it was an opportunity to create something new and exciting that would break through a weather-wearied slumber. That’s the beginning of the story of Ice Box, Prince Edward County’s newest arts festival which will take place at the Macaulay Heritage Park this weekend and next. 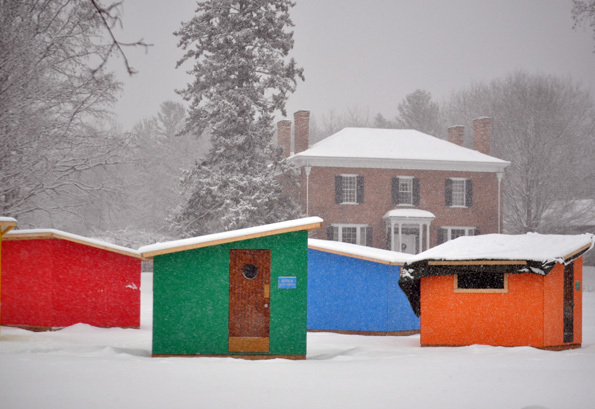 Dalby started researching other winter events around the world and she found an event in Minnesota where ice fishing huts were transformed into arts installations resonated with her. Dalby shared the idea with other artists who form a collective group called the Department of Illumination and they set the planning in motion. First, they received a grant from the WDS Foundation that paid for materials to create giant ice huts to host interactive arts events. Then, they went about planning a schedule and finding a location. “We’ve got tons going on. In each of the huts we have a different artist or team of artists who have created an installation working in different media. We’ve been holding a series of community workshops over the past months. Some of the things created by both adults and children are going to be appearing,” Dalby explained. For example, last weekend Sarah Selecky led a creative writing workshop at Macaulay Heritage Park. Artist Susanne Larner will be taking some of the stories that were created and adding a visual representation. In another display, Nella Casson’s workshop group, the Ice Box Stitchers Society, have contributed fabric arts that will be incorporated in a different way. “We don’t want to give too much away. You don’t know what to expect when you walk in the door. That’s the beauty of installation art, it has that element of surprise,” Dalby said. Around the installations, there will be a mix of family friendly activities. There will be snow-pants yoga, snowshoeing and marshmallow roasts with the Picton recreation committee, and storytelling, improv, and live music in Macaulay Museum. Macaulay House will be filled with warmth and the aroma of wood-fired pizzas. Twice, there will be large group dances outdoors. “We’ll make a big circle every day out in the snow. There will be paper mâché animal heads some people will be wearing for the dance,” Dalby said. The opening of the event will feature a greeting from Tyendinaga Mohawk elder David Jock. At the end of the festival, Feb. 10 at 3 p.m., a parade is planned. Members of the public are encouraged to bring instruments and costumes. The parade route is not yet set, depending on weather. Only one aspect of the festival — a portable sauna — comes with a cost. Dalby said the artists involved felt it was important to keep the event free and accessible for anyone wishing to attend. Dalby added Macaulay Heritage Park offers a beautiful backdrop and a willing partner in the County Museums that has offered its own volunteer contributions. Asked about what would make the festival successful, Dalby said she thinks it already achieved her goals. A full list of events is available online at iceboxpec.org.